Thanks, Lois! Yes, I imagine Pilate’s wife may not have been too happy when she heard what happened! Wow!!! I loved reading this perspective. You know, I thought it was remarkable that he publicly washed his hands off the death of Jesus. I never thought further about how he must have felt after. It was a great read. Thanks, I’m glad it made you think! Enjoyed this! Yes, may we always choose to please God over people. Thanks, Kelly! 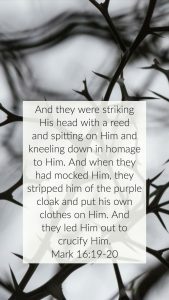 Yes, Pilate’s story is a helpful reminder of the dangers of people-pleasing! I love this perspective! Thanks so much for the fresh take on a familiar narrative! May it be a fresh reality as we prepare to celebrate the resurrection next week! Thanks, Stacey! It is a great focus as we approach Easter! I loved reading about Pilate in story form. Perspective is everything and you provided us the chance to see it from Pilate’s point of view. Thank you for taking us on this journey today. Thanks, Mary! It is always interesting to think about a familiar story from a fresh perspective! It’s a reminder I need in front of me each morning. I appreciate this more than words can say. Hi, Linda! Yes, it’s a great reminder which I need regularly too! Lesley, you brought Pilate’s struggle to life for me. To be such a man of the world, and yet to possibly feel angst of the outcome of Jesus’ trial . . . I can’t say how many times I’ve regretted choosing to please people rather than stand firm in what God shared with me. I’m thankful for God’s grace and forgiveness when I choose wrongly. And I’m ever grateful for the redemption He’s given us! Thanks, Jeanne! I think we all face those difficult choices between pleasing God and pleasing people at times. I’m grateful too for God’s grace and forgiveness when we make the wrong choice! I know i’ve often fought the same battle “people vs God”. Too often I choose “people”. How grateful I am for the true reality Pilate’s story helps us see, and for immeasurable grace to keep having opportunities to please God! Thanks for sharing, Jeanne! Thank you for taking us back to this very important day. It is so difficult when we are forced to make a decision between pleasing God and people. I am feeling pulled at this very moment and your post helped me to see it clearly. Thank you. Thanks, Maree! I’m glad you found it helpful. Praying for wisdom and courage for you in your situation! I loved reading the scripture in this way, felt like I was there with them. Would love to watch a movie from this POV. Thanks, Meg! Yes, I’m sure it would make a great movie! It is always interesting to try to step into the shoes of another. This post adds depth to the struggle Pilate may have felt. We all will face choices in this life. May we pray for strength to choose well. Blessings! “Strength to choose well” – thank you for sharing, Joanne! Thanks, Joanne! 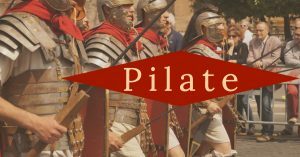 It is really interesting to consider what it might have been like for Pilate, and also to think about how it can help us in choices we face. Blessings to you too! It is interesting to imagine what people may have thought or what we would have done. It is really interesting to put ourselves in the characters’ shoes and imagine what it might have been like. Also to think about how their situation might relate to situations we might face. I wonder what I would have done as well, Rebecca. It’s easy to look from our vantage point and criticize, but would I have done differently? I know I’ve acted as Pilate did countless times. Judas too.